Hey everyone, I've been speaking with Forbs a bit lately and we both really like the Idea of getting some more PvP going for the guild. This is a PvE server and i know a lot of people don't love PvP, and others just may not have much experience with it. What I am proposing is putting aside one night a week to work together on PvP gearing and play. 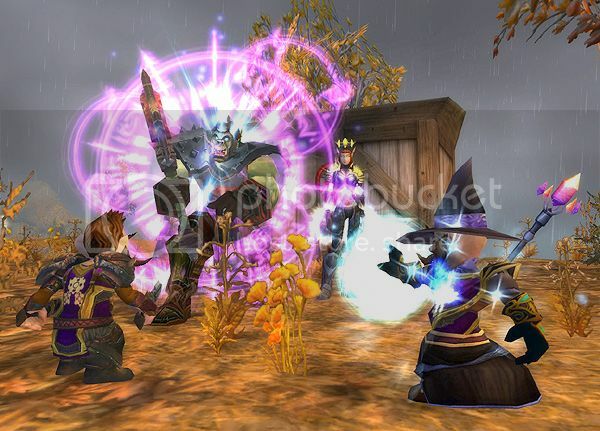 We can do anything from Premade BG crews of 5 (using vent to coordinate), Organized dueling, doing some Arenas for learning / conquest point purposes, or just work on getting gear through various methods of Honor collecting. The current state of PvP is that the ilvl 522 Grevious Gear is in use by most PvPers, our best bet of gearing up involves working together as a team. I've discussed things a bit with some of my PvP friends and what I am being told is that currently if you are in Timeless gear that is better than the crafted PvP gear (in most circumstances), but worse than the Tyrannical honor gear. The first PvP night is planned for this Wednesday, so come on out and lets show the horde that Size matters. Large players are just large targets. First PvP night scheduled for Wednesday at 7 PM server time! We are going to have some organized dueling, everyone will have a chance to do a little PvP in a friendly atmosphere. Come out and go a few rounds. Winner for the night gets a special prize. Sweet, I'll be there if you don't mind a fire mage PvPing. I definitely like the idea of regular PvP nights. We've lost a lot of members in the past who like to PvP because we just didnt have enough going on there. So I'd like to see this succeed. One last thing for those of you who see PvP as "of the devil". Countless dungeons and raids have probably drilled into your head that "Death Equals Failure." But you need a completely different mindset for PvP. In PvP death is simply part of the game. Everyone dies...ALOT, even the good players. All death means in Battlegrounds is that you have to sit in the "penalty box", and the other team gains a slight numeric advantage for a few seconds until you get back into the game. Its not failure, its not personal, its just part of the game. Once you understand that, then you can begin to have FUN in PvP! Each Battleground is a slightly different game to master, and its not a you vs the other guy situation. Its your team vs their team, and its the team that works best together that almost always wins. Actually, Forbs, there's another reason why death in PvP isn't all that bad, at least in battle grounds. You get to visit the sexiest non-gnome in the game! The spirit lady! *whistles* She's quite fond of the gnomish flirts and loves to receive white roses. Excellent points made by both of you. Death is so inevitable in PvP it's not even funny. Especially when gearing up. That being said once we get used to running as a group we could so some pretty remarkable things. I watched a horde premade absolutly destroy the alliance in an AV yesterday because they snuck in a 10 man premade. First they turtled us then they slowly advanced kill farming the whole way and this was all because of 10 coordinated players working together on a 40 man team. I might be up for some pvp teamworky things. Wednesdays are not the awesomest nights for me because of my work schedule, but if people are still on and doing things by the time I log in, then I would like to join in. Hope to see you there Pipp! I want to find a day that works for as many people as possible without interfering with other guild stuff so next week we may use a different day. Maybe I'll make a survey post later to see what days will work best. Warcraft in the evenings is not possible for me, but having said that, I've played Alterac Valley over 600 times now, and fancy I know a fair amount about how to play that particular battleground, especially as hunter, rogue, monk, and warrior. If anyone feels like asking me questions, in game and out, fire away and hopefully I can help out that way.